In terms of grade, the global barite market has been divided into up to 3.9, Sp. Gr. 4.0, Sp. Gr. 4.1, Sp. Gr. 4.2, and Sp. Gr. 4.3 & above. Barite is chemically inert and insoluble. Each grade is used for certain specific applications. Barite is classified based on its purity, i.e. the concentration of barium sulfate present in barite. Accordingly, the specific gravity of barite varies. Barite with specific gravity of 3.9 g/cm3 or less falls under the up to Sp. Gr. 3.9 grade segment. The Sp. Gr. 4.0 segment comprises barite with specific gravity of 4.0 g/cm3. Sp. Gr. 4.0 grade barite is usually used as a weighting agent in drilling mud applications, specifically in the oil & gas industry. Barite with specific gravity of 4.1 g/cm3 falls under the Sp. Gr. 4.1 grade segment. Barite of this grade is largely used in oil and gas drilling activities across the globe. Barite of the Sp. Gr. 4.1 grade is approved by the American Petroleum Institute (API) for usage as a weighting agent in oil and gas drilling fluids. Sp. Gr. 4.2 grade barite is a widely used barite. It has specific gravity of 4.2 g/cm3. The API has authorized its usage as weighting agent in drilling fluids. Sp. Gr. 4.2 grade barite can be used as a filler in industries such as paints & coatings, rubber, and plastics. Barite with specific gravity equal to or more than 4.3 g/cm3 falls under the Sp. Gr. 4.3 & above segment. Barite of this grade is primarily used as a filler in industries such as paints & coatings, rubber, plastics. It is also employed in pharmaceutical applications due to its high purity and low reactivity. 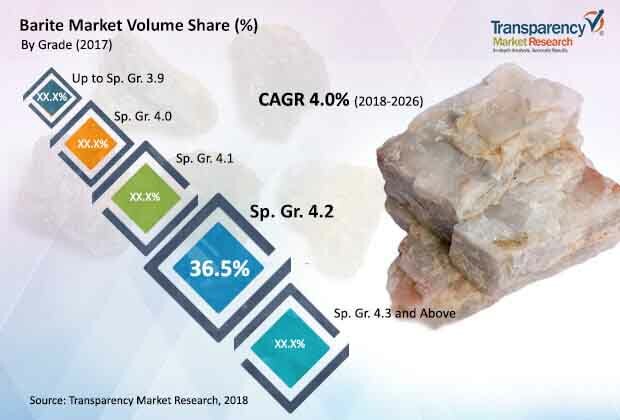 In terms of region, the global barite market has been segregated into North America, Europe, Asia Pacific, Latin America, and Middle East & Africa. North America is the leading consumer of barite across the globe; the U.S. accounts for significant share of barite, primarily for oil and gas drilling activities. Asia Pacific follows North America. Consumption of barite in Asia Pacific is not only limited to oil and gas drilling activities, but the mineral is also used as filler material in paints, coatings, rubber, and ceramics. Consumption of barite is also high in Middle East & Africa owing to the presence of large reserves of crude oil in the region. Increase in production of oil and gas is the key factor driving the barite market. Barite is used to elevate hydrostatic pressure to counteract high-pressure zones during drilling activities. Rise in global demand for energy has boosted the production of oil and gas. Developing nations such as China and India are expected to dominate in terms of energy consumption, largely due to the rapid industrialization and urbanization in these countries. Global production of oil and natural gas increased substantially from 2005 to 2017. This has resulted in excessive drilling and exploration activities, thereby propelling the global demand for barite. Availability of large number of substitutes for barite is likely to hamper the market. Celestite (strontium sulfate, SrSO4) and iron ore are ideal substitutes for barite. However, these alternatives are not yet widely used in the oil industry; barite continues to be the preferred commodity for usage in this application.